The oncology vet and his team presented us with their recommendations: radical surgery to remove the tumor, plus take four ribs (the tumor covered that large of an area), and do reconstructive surgery of her ribcage. Additionally, RCi would have weekly radiation treatments for eight weeks at another university about 120 miles away. If we went this route, RCi would have an 80% chance at potentially 12 months of life, which included the months she would be in pain and recovery from the surgery. The other choice was to do nothing and sadly concede in euthanizing her in three to four months, due to deterioration from the aggressiveness of her type of cancer. RCi’s family wasn’t comfortable with pursuing an aggressive treatment plan. They worried that her quality of life would be too compromised. Instead, RCi’s family decided to choose a natural route, which included a natural, high quality diet and high doses of antioxidants. They consulted with some experts in dietary supplements and did a lot of research and ended up putting together a special blend of blue-green micro-algae of Spirulina and Chlorella, fresh ground flax seed and millet, plus the amino acid L-Glutamine. Her tumor, which was a fist-sized mass protruding from her ribcage, was suddenly reduced in size. And best of all, RCi’s health never declined and she proved it by continuing to be robust as ever in her daily activities. RCi ended up surviving an addition 34 months, without any conventional treatments to fight her cancer. Simply amazing. While not every dog will enjoy such phenomenal results without conventional treatment, RCi’s story should give hope to those who cannot or do not want to pursue conventional cancer treatments for their pup, or have been told there is ‘nothing that can be done’ to save their pup. So, how can your pup benefit from RCi’s success story? 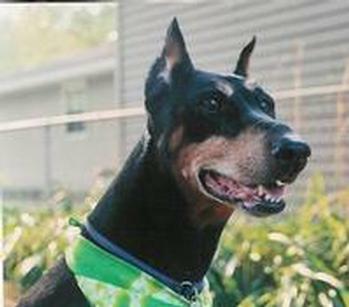 In order to help other dogs fighting cancer and to help healthy dogs maintain a strong immune system, RCi’s parents, Jill and Mike Spencer, formulated their special antioxidant blend, and started a company, A’Dobe Angel, to give other pet owners access to the same supplements that helped their beloved girl. APA ANTIOXIDANT BOOSTER is designed to boost immunity and naturally support the body in its fight against cancer. It can be sprinkled right on your dog’s food, and is good for health maintenance too. My bulldog Sampson has been using it and loves the addition of APA Antioxidant Booster in his food bowl each day. To learn more about APA Antioxidant Booster and to read RCi’s full story, visit the A’Dobe Angel website at: www.adobeangel.com. **Please Note: Always consult with your vet before starting any supplement for your dog with cancer. Some natural supplements may interfere with certain conventional treatments, or may not be recommended for dogs with certain health conditions. This supplement may NOT be recommended for dogs who have ever had a seizure or are currently on anti-seizure medications due to the ingredient L-Glutamine. And, if you would like to receive future e-newsletters from Georgia’s Legacy to learn about other success stories like RCi’s, visit www.fightcaninecancer.com and sign up for our email list. This entry was posted in Cancer Treatments, Diet & Nutrition, News, Stories of Courage and tagged 42 Rules to Fight Canine Cancer, A'Dobe Angel, canine cancer supplements, Doberman, doberman with cancer, dog cancer treatment, fibrosarcoma, Georgia's Legacy, L-Glutamine, micro-algae, RCi. Bookmark the permalink. I’ve had several dogs die of cancer and my Cocker Spaniel was diagnosed last year. I could have had surgery to have the tumors removed but instead went the natural route. I found Resvantage Canine, which is a resveratrol supplement. Resveratrol has been found to be a natural chemopreventive. Since taking Resvantage on a daily basis the cancer has since gone into remission.